The Mahindra work culture gets globalised with the Global Recruit Programme; creating new milestones in helping new recruits assimilate into the organisation. At the end of his undergrad year at Yale, in 2002, Ryan Floyd applied to hundreds of companies in emerging markets like Brazil, Central Asia, Russia and India... A student of history and an adventurer at heart, Ryan foresaw opportunities in living and working in India, way before Wipro and Infosys were featured on covers of glossies in the US. He managed to procure a job at M&M with Mahindra Shubh Labh and worked there for 19 months. And thus, the seed of the Global Recruitment Programme (GRP) was sown. “What Ryan’s stint in India did for us, is that it brought to our notice there are people out there with talents we can utilise. We have lots of engineers, MBAs and CAs, but like most companies in India, we don’t look at Liberal Arts with much respect. 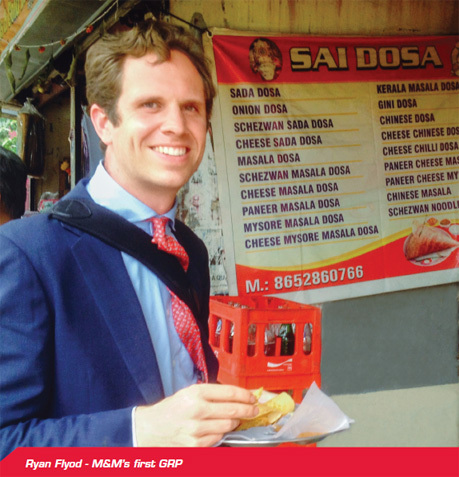 Ryan’s stint helped us to realise that talented people with a high quality liberal arts background could bring in a perspective which is new and valuable,” says Prochie Mukherji, Chief of Staff at the Mahindra Group. The primary objective of this programme is to infuse global culture into Mahindra, encourage cultural fluency and expose us to alternate ways of doing things. In turn, the global recruits gain first-hand experience of working with people from varied cultures and backgrounds. Positions are fixed-term assignments of 24 months, although further employment may be negotiated at the end of this contract. “THE FIRST FEW MONTHS AFTER THEIR ARRIVAL, THERE ARE A LOT OF MIXED FEELINGS ABOUT THE CHOICES THEY HAVE MADE. MUMBAI, WITH ALL ITS VIBRANCY, CAN BE A BIT DAUNTING FOR THE UNINITIATED! THIS IS WHEN WE GIVE THE COHORT THE MAXIMUM TLC TO HELP THEM THROUGH. IT IS AMAZING HOW WONDERFULLY THEY SETTLE IN THEREAFTER. THOSE WHO HAVE THE MOST TRYING TIMES IN THE BEGINNING ARE THE ONES MOST LIKELY NOT TO LEAVE MUMBAI AND TEND TO EXTEND THEIR STAY IN THE COUNTRY BEYOND THEIR TWO YEAR CONTRACTS EITHER AT MAHINDRA OR WITH OTHER COMPANIES IN MUMBAI,” OBSERVES JAY SHAH, VP CULTURAL AT THE MAHINDRA GROUP, AND OFTEN REFERRED TO AS THE ‘BIG BROTHER’ OF THE GLOBAL RECRUITS. Initially, the going was not easy for Mahindra. 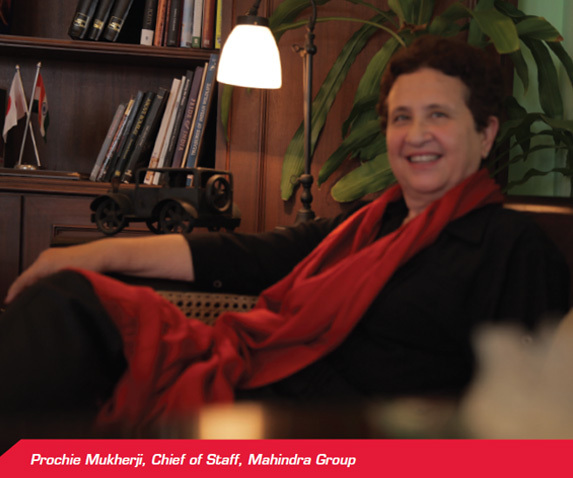 “Who’s Mahindra?” was a question Prochie faced when she first started going to Ivy League colleges to scout for talent best suited for the Group. It is still a challenge, albeit less with each passing year. Besides word-of-mouth, publicity and spreading the news to college societies and departments with an interest in South Asian studies, the team has also built close relationships with the Career Services of each college to find the right applicants. Initially the recruits were inducted directly into businesses. After Ruzbeh Irani took over the Group Strategy Office (GSO), then known as Office of Strategy Management (OSM), the programme was revamped to become what it is today. Michael Delfs, himself a global recruit worked closely with Ruzbeh and Prochie to revise the programme. A stronger system of identifying the right candidate was put into place and the recruits were inducted into the GSO for the first year. From the GSO, they do projects for and with the Group companies, which can range from international penetration strategy for the two wheeler business in Latin America to research on demographics and market entry strategy for products in the African market, or even new businesses that Mahindra plans to get into. It is a win-win situation for both the company and the recruit because businesses can identify those who will add value based on tangible evidence they show in the first year. Likewise for the recruits, this is a time to settle down in the Group, a vantage point wherein they can get a perspective of the entire Group and then in the second year work with companies they are truly interested in. In his second year, Michael moved from Tech Mahindra, Bangalore and joined Mahindra’s nascent corporate venture capital team in Mumbai, the Strategic Innovation and Research Fund (SIRF). “By joining SIRF, I had the opportunity to help write the initial processes for how they would source and evaluate deals. I worked on the first few investments. It provided a fascinating look at the Indian venture capital scenario and start-up community during 2007-2008, when investments swelled to record levels.” admits Michael. Some of the most rewarding projects have come from Mahindra Partners and Mahindra Lifespaces. Russell Mason, for example, was part of the team that conceived the Affordable Housing and stayed on till the project was launched. Similarly, Alex Boyce and Danfeng Wu worked with Mahindra Genze in California and Shanghai respectively after completing two years with the programme. .
Every year, the programme is tweaked to incorporate feedback from the global recruits to improve it continually. Today, there is a better understanding within the organization of what liberal arts graduates bring to the table. What the recruits get out of the programme is an experience of working in India - it is great to work in a culture that is completely different, that tests one’s adaptability as well as skill and cultural quotient in a foreign environment. Sure, at times it is an uncomfortable experience for them because it pulls them far out of their comfort zones. However, at the end of two years, most of the recruits feel that this period has been one of immense personal growth. It is then that they figure out who they are and what they are capable of.